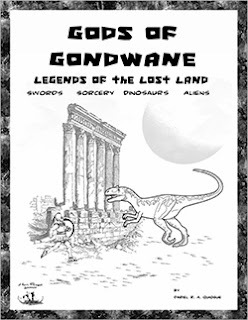 The Free RPG Blog: Gods of Gondwane by Dariel Quiogue lets you ride a Velociraptor! Gods of Gondwane by Dariel Quiogue lets you ride a Velociraptor! Gods of Gondwane: dinosaurs, humans, aliens, machines, living gods and behind it all a race of turbo-pillocks called The Shapers. Got your attention? You're probably aghast at the thought of thrusting all that into a single game, I was. How could it possibly hang together coherently? How can a single system handle that much imagination juice? Dariel R. A. Quiogue is a setting-first type of chap. He paints Gondwane not with dainty bristles but with pregnant clods of rich paint. Gondwane is a land lost in time, created by a race of time-travelling mega-ball-bags called The Shapers who are desperately trying to find out why mankind will eventually supplant them. Mimicking Dariel, the Shapers lob civilisations together in an experiment to understand what makes mankind so jolly good. The Shapers watch the experiment for a while and when humanity shows that they are the best (again), The Shapers 'reset' Gondwane in an Etch-A-Sketch ending. What utter gits. You are a human, born into this melting pot of exploration, survival and the wonder of the unknown. As a human, you might be from Modern Earth, Gondwane's latest experiment cycle or a previous experiment. Character creation is descriptive, concepts and ideas are forefront. Your character are defined by Roles (e.g. Toothbrush salesman), Assets (e.g. Charming) and Hooks (e.g. Compulsive liar). Your character's pulp-iness is measured by your "Guts". You assign points to these attributes, each point representing a D6 die you roll. 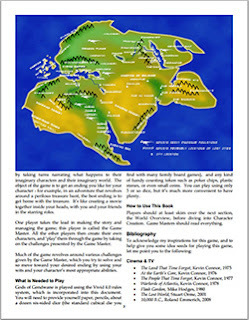 The rules guide you through, making plenty of recommendations, which does take the chore out of descriptive character creation. It is important to cater for the brain-worn gamer at the table, who wants to riff off suggestions rather than pull ideas from the blue and Gods of Gondwane hits the mark spot on with this. Dramatic systems require detail and as players, you will spew vat loads to earn bonus dice. Only actions that can be contested require a dice check. It is a solid dice pool system where you roll a number of D6s equal to your most applicable character Role, the enemy does the same. The one with the highest die wins. If you roll the same highest die, you narrate to too-ing and fro-ing of a dramatic draw and roll again. The winner narrates the victory. You may add Risk dice, which are D6s of a different colour. You can ask the gamesmaster for up to three to help succeed in your action. 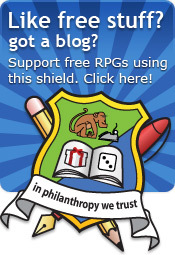 If any of those Risk dice land the single unblinking eye of a 1, then something's gone quite wrong. Your Asset dice can be tapped to boost the pool you're rolling. Once your Asset dice are depleted, you need to perform an appropriate act to replenish them. Combat is a narrative to-and-fro and without hit points, the winner of the fight kills the opponent. Our heroes have a chance to save. The setting is sumptuous, the empires a numerous and feel ancient. Gods of Gondwane is not just about cruising around on a pet Velociraptor, slotting up hairy neanderthal man, there are ruined remnants of civilisations from previous experiment cycles. My favourite is Megastyros, the City of the Dreaming Lords who are addicted to dreaming. There's a bestiary (which are dinosaurs), a list of further read, example character builds and a sample adventure! Everything is laid out neatly and the writing is good throughout. The mechanics are simple and narrative but I think the sections describing skill checks could be rewritten more plainly and simply. I think it is best to assume the reader is stuffing their face with cookies while they are reading the mechanics and not really paying attention. As an author, I would give the game another read through as there are a few instances where rules are referred too but have since been removed. My long suffering Icar proof readers have found many instances where I have deprecated a rule or term and not removed it everywhere. 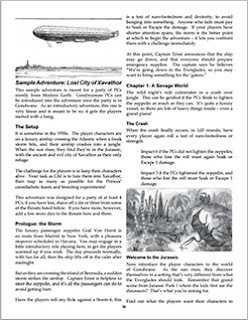 I would include a list of plot hooks too to help the new GM to transition from the sample adventure into a large campaign. The layout could do with a tweak: increasing line spacing, moving the contents to the front, increaing the bottom margin (so that page numbers are easier to pick out) and modify the spacing between pictures. I appreciate that these tweaks can take forever but I believe that attention to detail can lift the quality. Did I mention you can ride a Velociraptor? Gods of Gondwane is more than a pulp one shot, it is coherent blend of ancient themes, superstitions and adventure. The system (called Vivid 4.0) labors capably under such a gluttonous insanity. I am wary of games that use exploration as a core goal as exploration is a bi-product of playing any campaign RPG. It is a bold gesture to claim that exploration is an end in itself but reading Gondwane, you can't help but be drawn into the setting and imagine exploring its broken history. Dariel fulfills the promise of exploration with so much to see! It is an imaginative, magical delight and I urge you to give it a read. Thank you Dariel for sharing!